Increasing a country’s revenue mobilisation ability is not enough if countries’ resources are simultaneously drained as a result of illicit activity. There is currently no firm intergovernmental agreement on the conceptual framework defining illicit financial flows (IFFs). Measuring and tracking IFFs is extremely challenging because of the clandestine nature of the underlying activity. There is currently no single tool or process capable of eﬀectively measuring or estimating illicit financial flows (IFFs). Indeed, measuring and tracking illicit ﬂows is extremely challenging, since there is as of yet no firm agreement on the conceptual framework of an illicit financial flow. The lack of a definition makes it hard for such flows to be transparently or systematically recorded in a coordinated fashion. Members of the Inter-Agency Task Force (IATF) on Financing for Development (FfD) held an expert group meeting with academics and other external experts in September 2016 to discuss tax-related illicit financial flows (IFFs). Most of the participants agreed that: i) illicit financial flows constitute money that is illegally earned, transferred or used and ii) that crosses borders. Three types of flows are generally considered, which are not mutually exclusive or comprehensive: IFFs originating from (a) criminal activity; (b) corruption-related IFFs; and (c) tax-related IFFs. However, within this definition differences remain, particularly on how to treat tax-related IFFs. Tax avoidance practices such as base erosion and profit shifting are often in grey areas between legality and illegality because of differences in legal standards across countries, weak legal systems in some countries, and different interpretations and acceptance of norms on international taxation. Tax avoidance is covered by the taskforce in the clusters on tax administration and international tax cooperation. In discussing the idea of a single estimate of IFFs, there was strong support from a majority of the participants to keep efforts disaggregated and to work on improving measurement for the separate components of IFFs and modes of transfer. The figure shows a schematic representation of components and channels of IFFs, putting these elements into a wider context. At the Task Force meeting, experts debated whether it is constructive to aggregate different types of flows and activities into a single measure called IFFs. There was strong support from a majority of the participants to keep efforts disaggregated and to work on improving measurement for the separate components or channels of flows. They felt that the different components of IFFs are not comparable, aggregation across channels and components could result in double-counting, and that looking at channels or components separately would be more beneficial in designing policy responses. In addition, measurement of the flows in some channels might overstate the domestic public resource impact, because the entire flow of resources would not accrue to the State if channelled legally. In other cases, there is little to no measurement of IFF through some channels because of a lack of data or methodology to make estimations. Notes: Components of IFFs include both source of funds and motivations of IFFs and may not be mutually exclusive. Individual transactions from different channels may be combined by actors to try to obscure the source, motivation and/or use of funds. Size of arrows does not represent the magnitude of flows, and are illustrative rather than comprehensive. Estimates have been made in the following areas: proceeds of crime, stolen assets, goods trade mis-invoicing, transfer mis-pricing, and undeclared offshore wealth. 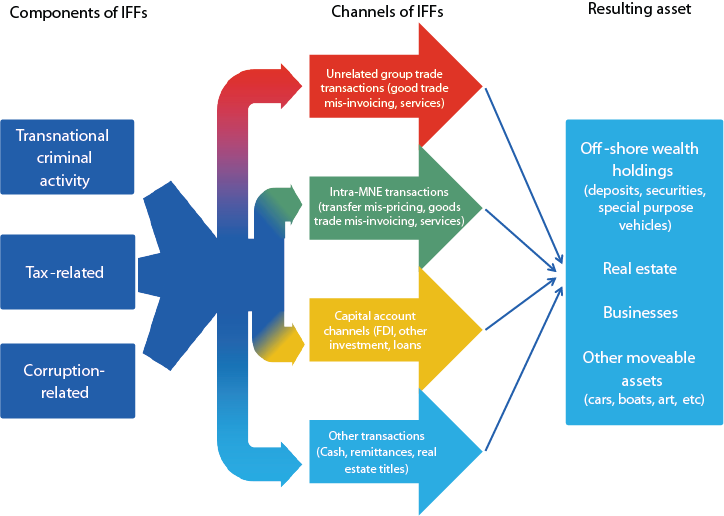 There are a few methods that are currently used to attempt to estimate some of these components or channels of flows, though they do not provide a global picture of the full scope of IFFs. The data sources are generally not robust enough for measuring changes or determining trends across years, and the methods also are not comparable or aggregable. The current status of some of the most cited estimates is included in the table. The figure shows the regional estimates of goods trade mis-invoicing that have been made to date, in response to the call in the Addis Agenda for such exercises to be carried out. The Economic and Social Commission for West Asia held a regional expert group meeting in early May 2017 to advance its plan for producing estimates for it region. In the context of the global monitoring of the Sustainable Development Goals, UNODC is the custodian agency for the indicator identified to monitor target 16.4. 1 Total value of inward and outward illicit financial flows (in current United States dollars) and is therefore leading and coordinating the international community and other stakeholders’ efforts to develop the methodology to produce the indicator to reliably measure the target. In 2017 UNODC, UNCTAD and other institutions will organize an expert group meeting to begin the methodological work on the development of the indicator in coordination with the Inter-Agency Expert Group on SDG indicators. It is important for countries to work on the strengthening of existing institutions and enforcement of the law. Task Force members recommend component-by-component or channel-by-channel development of policy tools and options to address IFFs. Some of the policy options that will assist in addressing these components are addressed in the international tax cooperation section, for example transparency standards and beneficial ownership information. The development of new standards for regional or international exchange of financial information will also assist in enforcement. Fighting corruption and crime are addressed in other areas of the Task Force’s work. To more strategically tackle IFFs, the Task Force recommends conducting risk and vulnerability assessments to help countries focus their data, monitoring, and enforcement efforts to the channels most relevant to their country contexts. Capacity building to fight IFFs should promote whole of government approaches to tackling financial crimes, encouraging inter-agency and international co-operation. Criminal activities are dynamic and adapt quickly to take advantage of new opportunities for financial gain, frequently outpacing the legislative changes designed to combat them. Countering these activities requires greater transparency, more effective intelligence gathering and analysis, and improvements in co-operation and information sharing among government agencies and among countries to prevent, detect and prosecute criminals and recover the proceeds of their illicit activities.